The optional top page Message can be used to promote offers, discounts, activities, events or anything you wish. You control your Message and can change it from week to week, leave the same Message in place for an extended time, or hide the Message completely. An optional Message is included at the top of the Newsletter. You can use your Message to showcase new offerings, promotions, discounts, activities, events or anything you wish. Your Newsletter may contain your business logo, your business name or a generic title such as Your Tree Surgery Advisor. The top right of your Newsletter includes a photo or image along with an address and contact information. Your Newsletter includes up to 4 optional navigation links to pages or sections of your website. Our experienced editors carefully select the articles linked in each issue of your Newsletter. The articles come from popular publications including online newspapers, magazines, and websites. The articles will always be up to date, they'll match the interests of your contacts, and they'll be interesting, informative and entertaining. 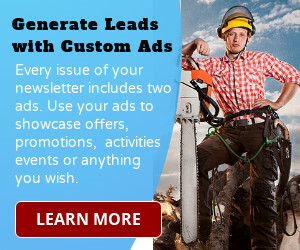 Every issue of your custom email newsletter includes two ads located here. Use your ads to promote new offerings, highlight a service or product, provide details for an event, or anything you wish. "Because my generation cares about the planet!" 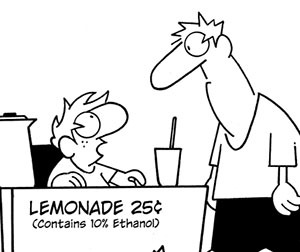 Your Newsletter includes an optional cartoon. What is another name for the herb wormwood? Your Newsletter includes a trivia question. Earth Day, an event to increase public awareness of the world's environmental problems, is celebrated in the United States for the first time. The day was Apr 22. What year was it? Your Newsletter includes link to a "This Day In History" video. "I know that if odour were visible, as colour is, I'd see the summer garden in rainbow clouds." Your Newsletter includes a quote of the week. Your Newsletter includes optional links to your social media pages including Facebook, LinkedIn, Twitter, YouTube and Instagram. We can also automatically post content directly from your newsletter to your business Facebook page. Your Newsletter includes an optional link to a subscribe form to grow your contact list. Your Newsletter includes an optional link to your past issues. The articles in our publications come from many sources. We do not endorse information or opinions appearing in linked articles. The articles selected are not sponsored, and we assume no responsibility for the accuracy of the information. Copyright for linked articles belongs to the linked source.